Cruising along the silty Cariboo River, we watched as a beaver swam to the shore against the current. Around each corner of the winding waterway was another vantage point of the serrated peaks and glaciers of the Cariboo Mountains range. Beyond it all was spectacular Lanezi Lake, which we reached in wonderful evening sunshine. Not too impressed with the first campsite we came across on the lake (it resembled a swamp), we pushed on to the next. Swirling clouds started to push over the peaks on the opposite side of the lake about halfway into our 3km paddle along the lakeshore. The sky started to get darker. No more than two minutes after our arrival on the beach of site no. 34, the heavens opened, thunder boomed and lightning lit up the lake. 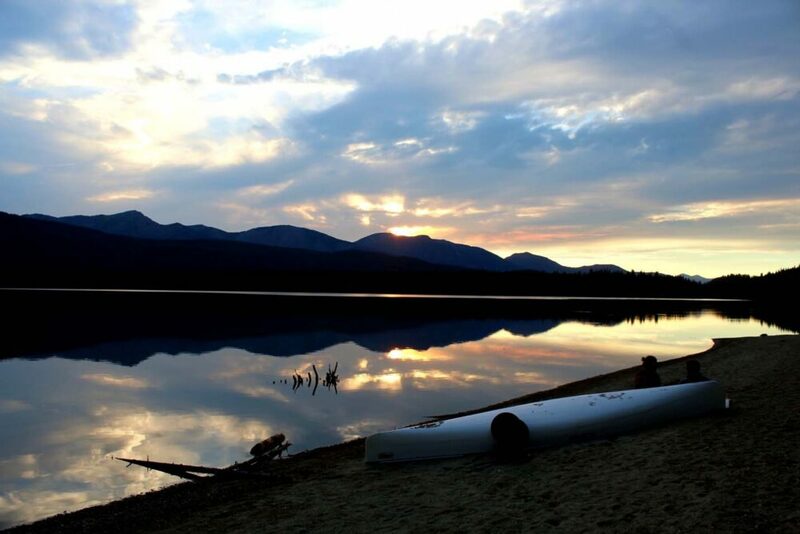 Sun to storm in less than twenty minutes…that’s the Bowron Lakes Canoe Circuit for you. 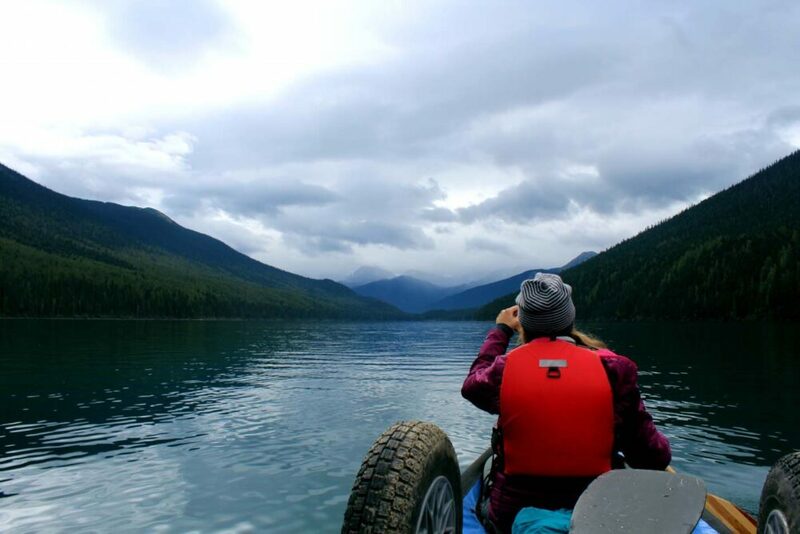 A perfect parallelogram of lakes, rivers and portages surrounded by temperate rainforest and imposing mountains, the Bowron Lakes Canoe Circuit is a geographical wonder. Looking at it on Google Maps, it looks like something quite unnatural. 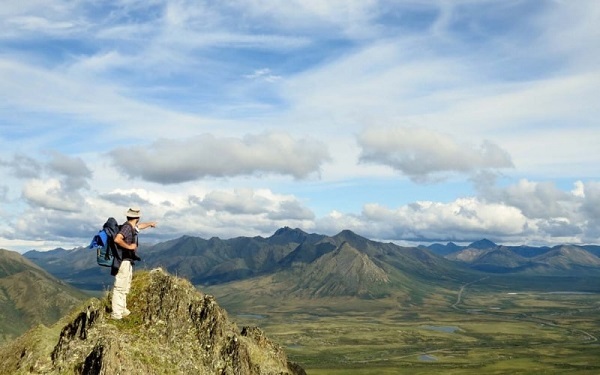 But it is actually the opposite; a wonderland for canoeists and kayakers alike, the Bowron Lakes Circuit enables an epic 116km journey through what is essentially a remote wildlife refuge with incredible topographic diversity. 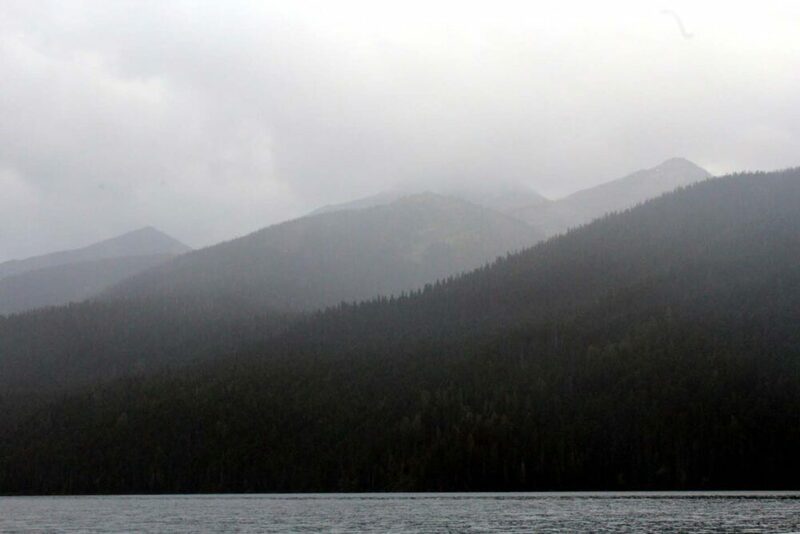 The eastern side of the Bowron Lakes is part of the world’s only inland temperate rainforest (and consequently is very wet) while the west features the rounded hilltops of the Quesnel Highlands. Lakes on the western side may not be lined with dramatic peaks, but they experience much drier weather and have remarkable views looking back towards the Cariboo Mountains. This post includes some affiliate links. This means I may receive a small percentage if you purchase anything through these links at no extra cost to you. Back to our stormy arrival at Lanezi Lake’s campsite no.34. It had been a beautiful afternoon, with the best weather since we had started the circuit four days before and also with the most impressive scenery. These factors were probably related but after so many days in the rain, I have to believe that there wasn’t much we missed during the first half of the circuit under those heavy grey clouds. We had still seen endlessly tall waterfalls rushing into the lakes, caught glimpses of ancient glaciers and got a chance to run moving water in the infamous ‘Chute’ and ‘Rollercoaster’ rapid sections. Though unlucky in our search for mountain goats and bears (as well as fish to eat), we did spot otters and all sorts of birds and eagles. August is known to be the busiest month on the circuit, but it is also typically the driest and warmest. This year was unusually wet (and cold, it was an average of 12c during the day), as we learned from the Park Facility Operators as well as other veteran Bowron paddlers. We fished in the rain, sang in the rain (at least I did), created mostly successful tarp structures in the rain, persevered with fires in the rain (wet wood and all) and rejoiced when it stopped. I do find that paddling in downpours has a certain serene charm to it (as long as you have the clothing to stay dry that is), especially with the eerie sound of loons calling to each other in the background. As much as I try to see the best in bad weather, it did cause two big issues. Finding campsites in the rain was not fun and the weather seemed to exacerbate the issue. The rain seemed to clump everyone together, particularly around the ten shelters and cabins based around the circuit. Most days we had to paddle an hour or two longer than preferred to find a place to camp at the designed sites….though admittedly I do realise I am pickier than most when choosing. Another issue were the portages – the hiking sections required between the lakes that did not connect with rivers or creeks. The first portage was perfectly maintained, dry and fairly flat; an easy start to provide confidence. Portages two through five were a different story. Unbelievably slippery with mud and severely rutted with canoe cart tracks, it was a portaging challenge like we’ve never experienced. The trip down to McLeary Lake was a particularly scary one with several steep drops and huge rocks. Trying to control a 140lb+ canoe from barreling down on top of me while descending a muddy path was quite a test I can tell you. Our friends too had an even bigger challenge of their own; portaging without a cart (not their original intention). Needless to say, all of us didn’t look forward to the portages. After the storm on Lanezi Lake, the weather calmed down somewhat. The next day, was the best day. A short morning downstream took us to Sandy Lake. Incredibly shallow, this lake was lined with wonderful sandy beaches (who would have thought?) and picture-perfect camping spots. Collapsed on the beach for the rest of the afternoon, our group was truly overjoyed at the appearance of sunshine, blue sky and the chance to really relax. We were now on the ‘dry side’ of the circuit which meant the only way was up, for both portages and paddling! That evening, a moose and her calf made an appearance that evening on the other side of the lake. Paddling a little closer for a better look, it was an amazing experience to see such a huge animal in its natural habitat. Before this, I had only ever seen moose on the highway (and very few times at that). Sandy Lake was good to us. We woke to more dry weather and those lovely views. 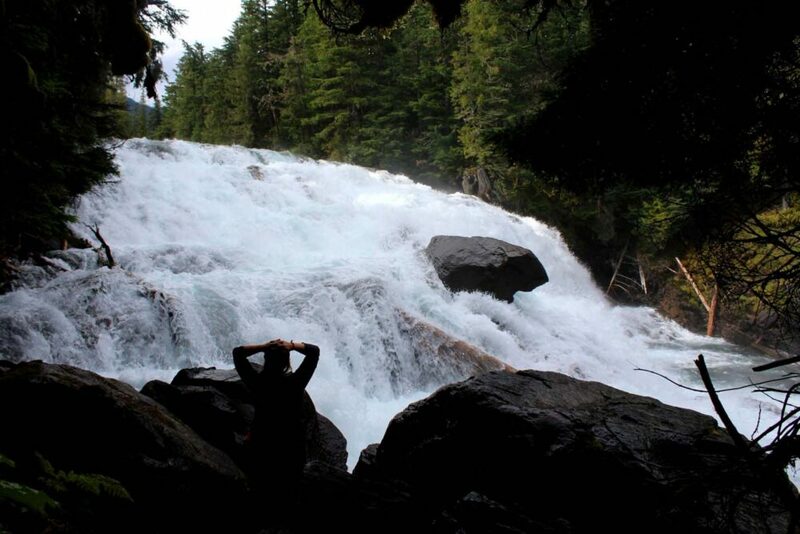 Our plan for the day was to visit the 24m high Cariboo Falls, a slight detour from the main circuit route. After an amicable split with our friends who had decided to skip the falls, we headed towards picturesque Unna Lake. 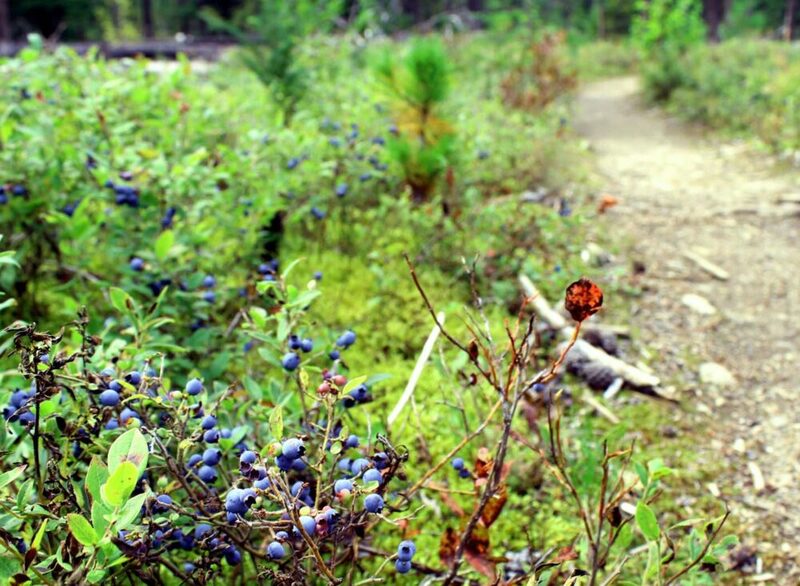 At the southern end of the lake is the short trail to the falls; a path lined by hundreds upon thousands of wild blueberry plants. Amazed at the sight, we stopped to pick a few handfuls of berries to add to our lunch all the while keeping an eye out for hungry bears. 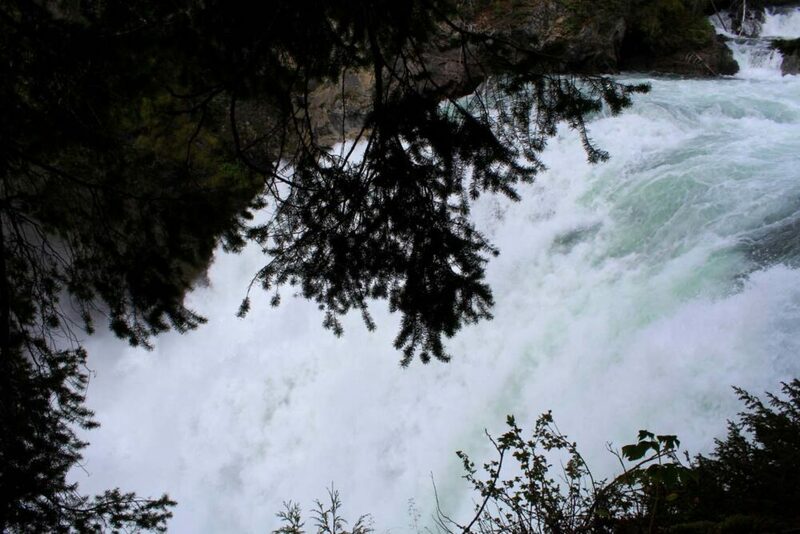 When we finally got there we discovered that the Cariboo Falls are spectacular; broad, multi-layered and immensely powerful. And to think we had just been paddling on the river that led to them! We had to canoe back up river to return to the circuit which was not as difficult as it may sound. After Unna Lake, the crowds seemed to drop off and we encountered very few paddlers. The first portage seemed almost somewhat surreal, being completely dry and with only one hill. It was over in what seemed like no time. The lakes on the “West Side” are quite small and surrounded by flatter terrain, but have incredible views looking back towards the Cariboo Mountains. We scored a great campsite on Spectacle Lake for our last night, on a sandy peninsula with 360 degree views. A quick swim in the lake was had before the wind (and a spot of rain) built up to frenzied levels again. Never mind, we ate freshly baked blueberry cake and kept an eye on our tarp that threatened to blow away any second. Deciding to finish while we were in good spirits (and there were ominous clouds everywhere), our trip ended on day seven, two days sooner than we had originally planned. The paddle back included a long section on Bowron River, a perfect place to fish and spot wildlife with the very slow current. Our final journey across Bowron Lake was not the smoothest as wind had built up over the afternoon. Nevertheless, we made it to the BC Parks landing dock before long, our week long adventure on the Bowron Lakes Canoe Circuit over. I have no regrets with our decision to end the trip early but I do have a longing to go back one day and just do the “West Side” of the circuit again, which is everything up to Lanezi Lake. There is enough in this section for a great standalone trip, without the hassle of the tougher portages and a higher risk of getting so wet! I would, however, miss the anticipation and excitement of the Chute, Rollercoaster and Cariboo River as well as the beauty of wonderful McLeary Lake, which were some of my favourite parts of the entire Bowron Lakes Canoe Circuit experience. The Bowron Lakes Canoe Circuit (near Quesnel, Northern BC) attracts thousands of paddlers from all over the world every year. The parallelogram is made up of twelve lakes, several rivers and eight portages. The full circuit is 116.4km long, with 10.8km as portage distance. The longest portage is 2.4km. The minimum amount of time needed to explore the full circuit is around five days, with seven being ideal. Four days would mean continuous paddling/portaging for long days. Seven days provided the opportunity for basically one ‘free’ day, which is nice in case of great weather or extraordinarily bad weather or lake conditions. If you have never portaged a canoe before (with cart or without) be aware that it is easy to underestimate how long it takes to complete the portages. 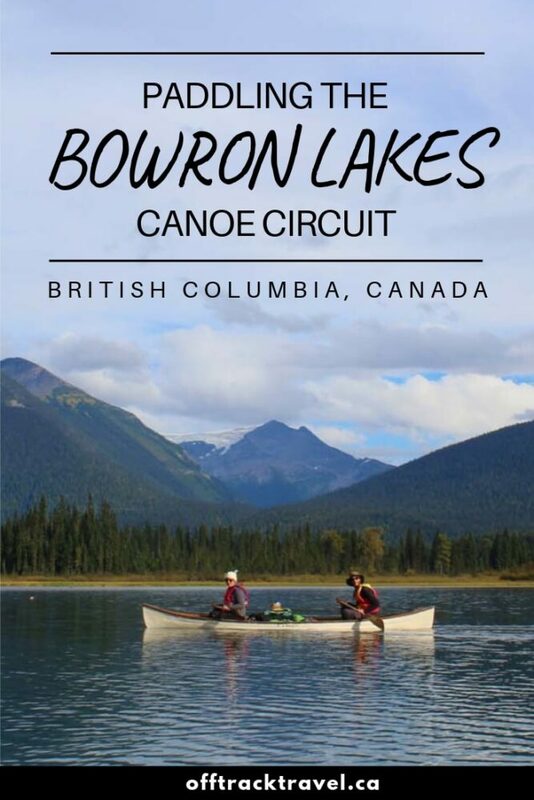 The full Bowron Lakes Canoe Circuit costs $60 per person at time of writing. There is a $30 fee per person for West Side visitors. 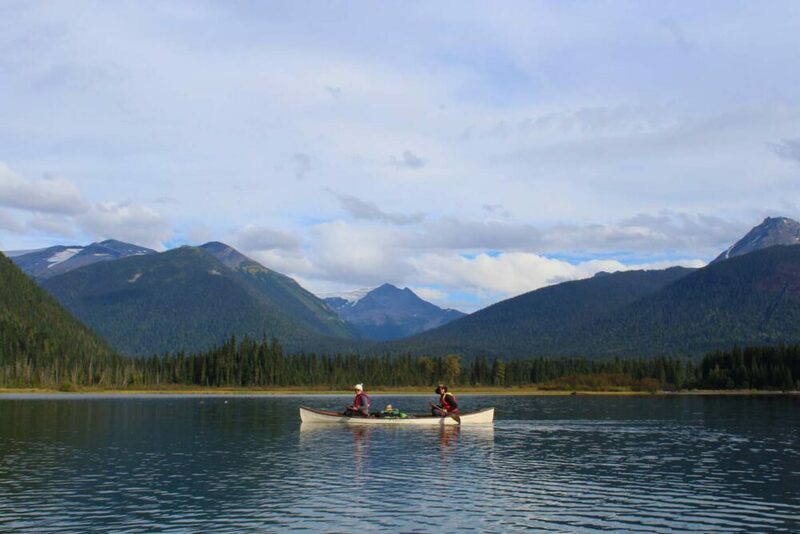 The Bowron Lakes Canoe Circuit has become so popular that reservations for the next summer season are now (as of 2016) available the preceding fall – reservations for summer 2019 opened October 2018. If you are planning a trip in July or August, a reservation is absolutely essential as only a limited number of paddles are allowed to start on the circuit each day. Reservations can only be made through BC Park’s Discover Camping system. 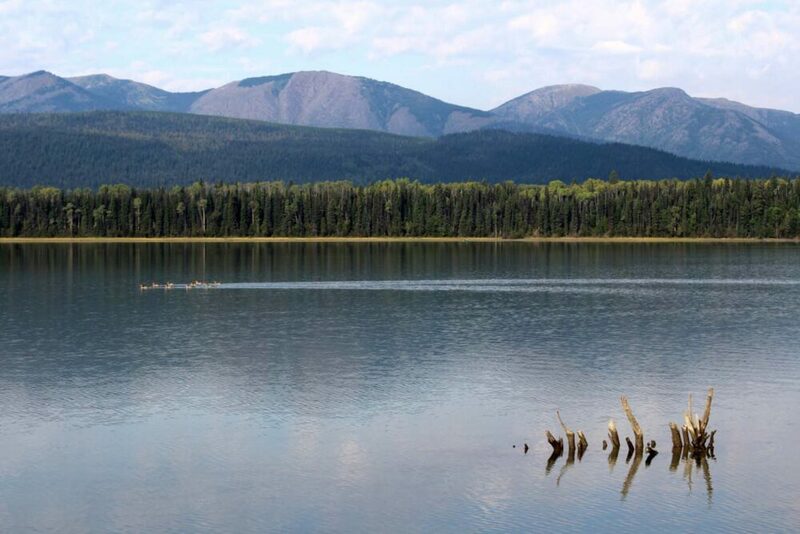 Paddlers on the Bowron Lakes Canoe Circuit must use designated campsites. There are 54 designated camp areas around the circuit – 10 of these being for reserved for groups. Each camping area has 1-13 tent pads. 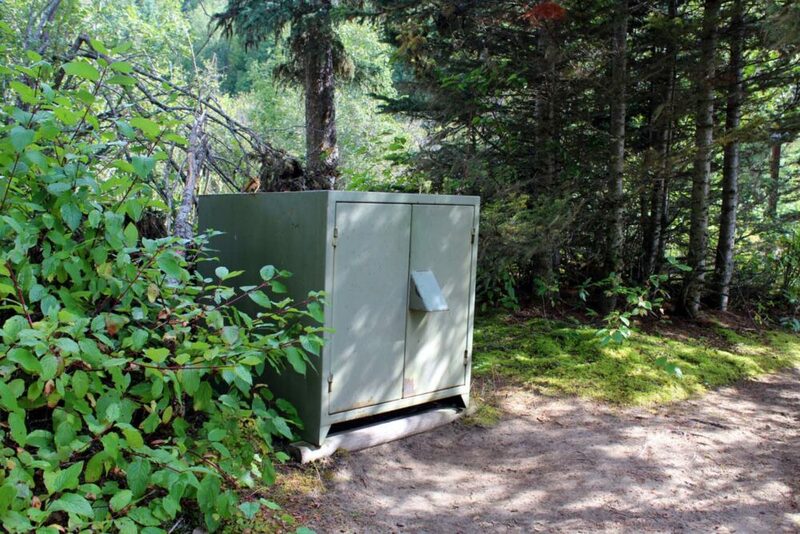 All have bear caches, an outhouse and are generally pretty clean. Some camping areas have cooking shelters or cabins. Woodlots are marked on the map of the circuit given at orientation. There never seemed to be much wood in these lots (and it was almost always wet), so my advice would be to keep your expectations low! The waterproof map also available at orientation, by the way, is a great investment. We stayed at campsites no. 6, 16, 24, 34, 39, 45. I would avoid 32 (the swamp site) during damp summer seasons. If possible, try and stay at 31 on McLeary – beautiful views and only one camp area on this lake. 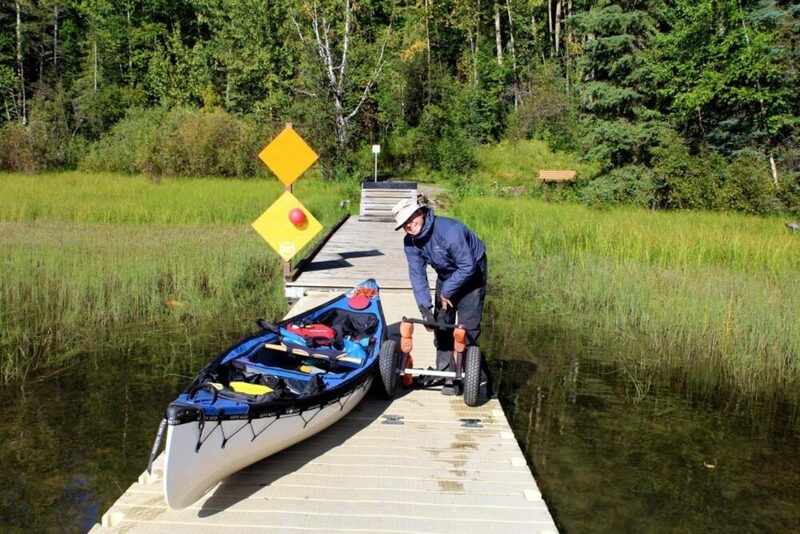 Paddlers on the Bowron Lakes Canoe Circuit must attend a short orientation (approx 30 minutes) and have their gear weighed before setting out. Orientations are held at 9am and 12pm every day. 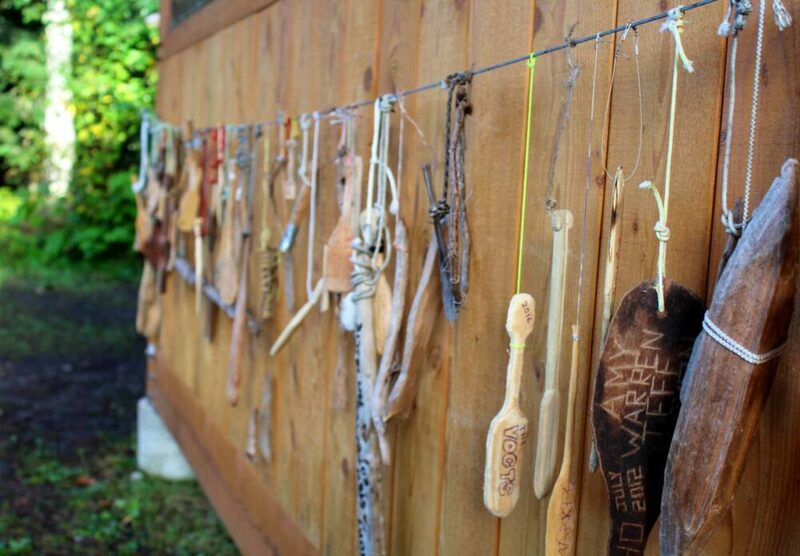 Paddlers choose their orientation time when making a reservation. Weighing of gear is mandatory if using a canoe cart. Paddlers can only place 60lbs worth of gear in each canoe as to not overload and damage the portage trails. All gear over and above this 60lbs must be carried. The on-duty Facility Operator (BC contractors) will note down all items allowed in the canoe (within the 60lb limit) on a registration card that you must carry around the circuit. Aside from basic paddling accessories (PFDs, paddles, rope etc) we found out that there are quite a few other exceptions to this 60lb rule such as first aid supplies and tarps. Expedition canoe cart – Accept no other type of cart! 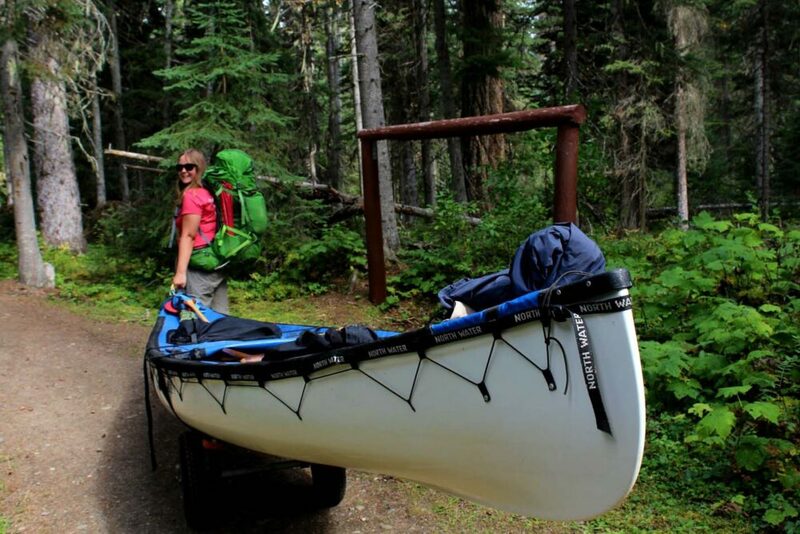 A proper expedition canoe cart has supports along the length of the canoe (NOT widthwise like the majority of kayak carts), has durable wheels and can withstand heavy loads. 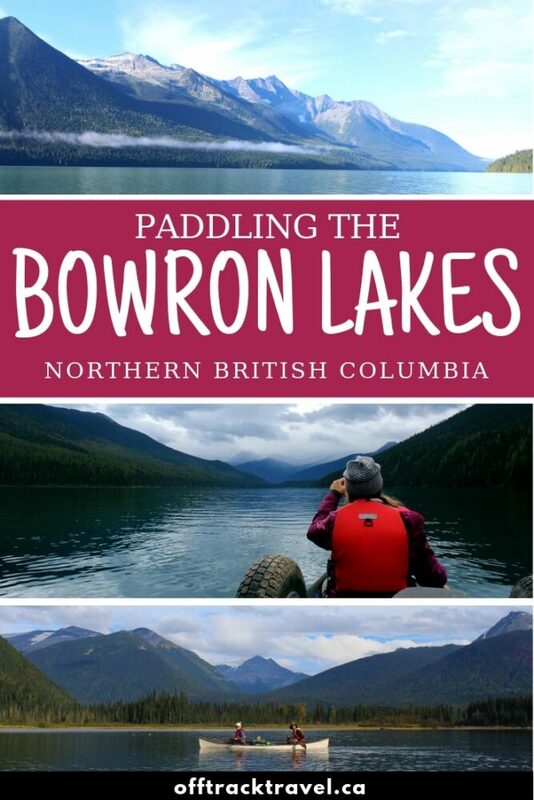 Bowron Lakes book by Chris Harris – Great to prepare for the trip before you go and also useful while paddling for historical and navigational information. 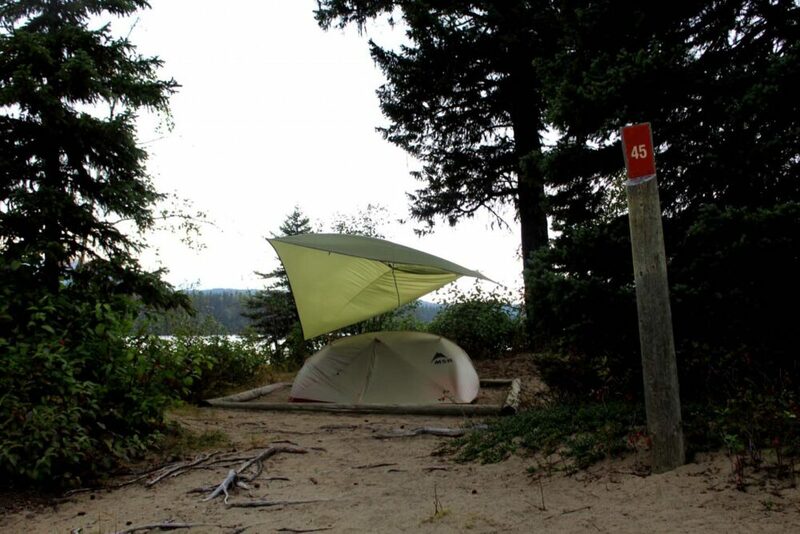 Siltarp – These ultralight tarps are invaluable for shelter while paddling the Bowron Lakes circuit. Compared to a regular tarp, they help save extra weight and bulk on portages. Merino Wool socks – The best socks available to buy in my opinion. Merino wool keeps your feet warm even when wet, dry quickly and don’t stink. Ideal for the Bowron Lakes canoe circuit! Hammock – It was SO nice to be able to put a hammock up and relax off of the ground! 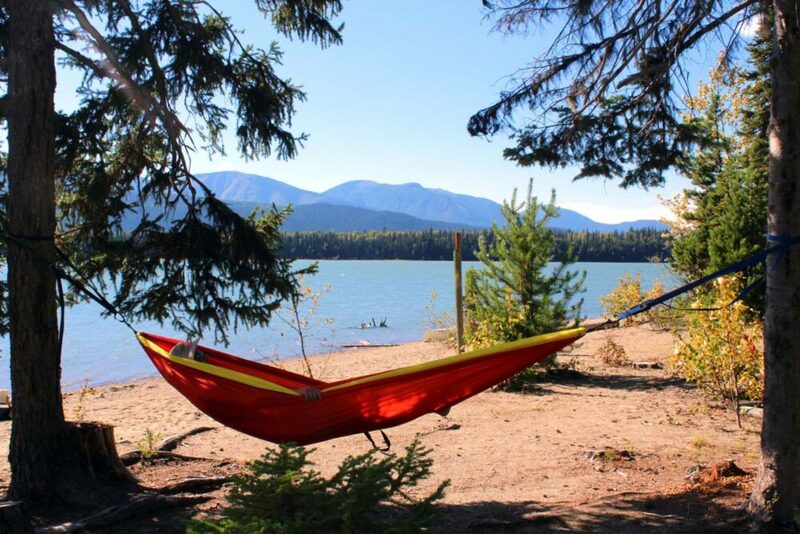 Our ENO double hammock is both lightweight and fairly small to pack. Pelican camera case – Pretty sure our DSLR camera would have drowned or been damaged on one of those rocky portages without this hard waterproof case. Firestarters – Trust me, you’ll be wanting a fire when paddling the Bowron Lakes! Whether you’re using it to warm, cook on or just to enjoy, being able to light a fire quickly is always good and firestarters definitely help. 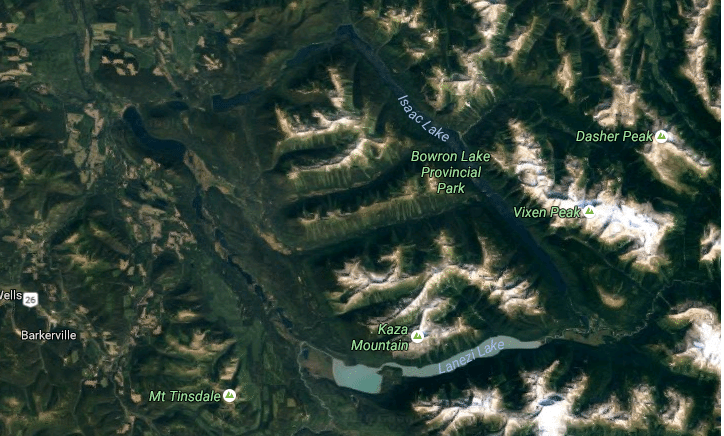 The start of the Bowron Lakes Canoe Circuit is in a reasonably remote area. 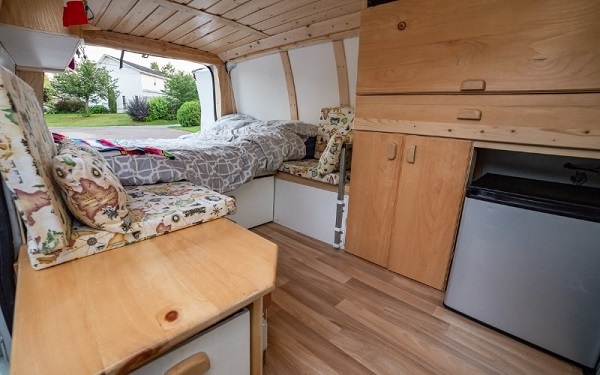 There is a small cluster of housing and visitor accommodation (RV camping, cabins) around Bowron Lake, including some canoe outfitters where you can rent gear and boats and also purchase some last minute supplies. 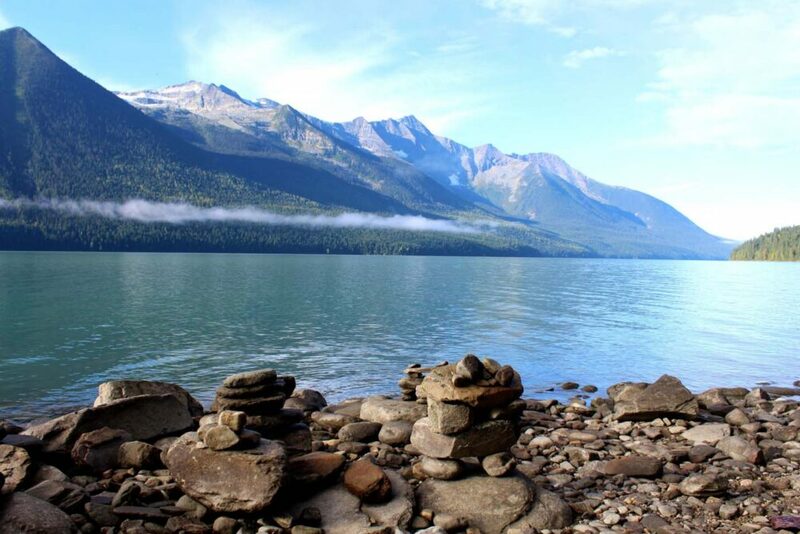 Bowron Lakes Provincial Park has a nice drive in campground, with 25 sites available for $18 each. 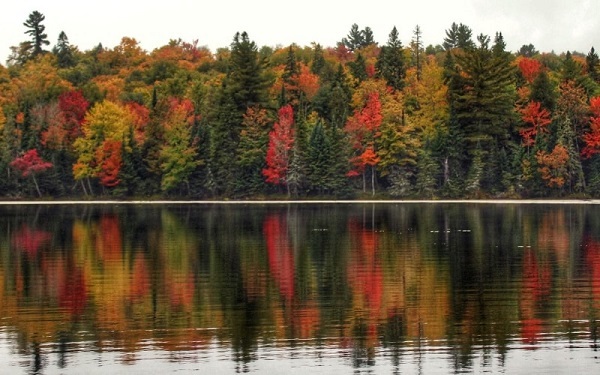 Bowron Lake is approximately 30km away from the small town of Wells. There is a couple of restaurants, shops (including a general store for basic supplies) and accommodation options here. Big H’s Halibut and Chips food truck in the centre of town would be our top recommendation for a post-Bowron meal – the owner is a Pacific coast fisherman for over 25 years and knows how to source the best (and freshest) fish and cook it well. 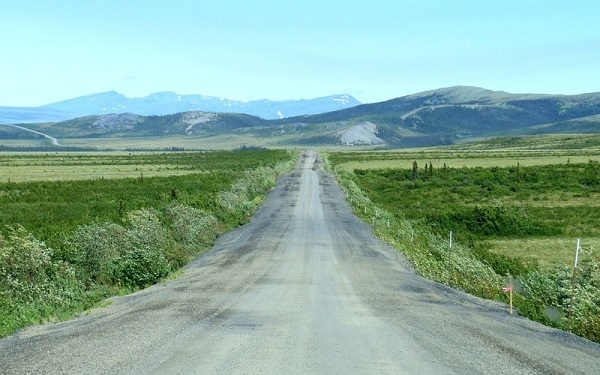 The road from Wells to Bowron Lake is a very well maintained dirt road. Note that cell phone signal is very sparse after leaving the city of Quesnel. We had no signal at all in Wells or in the Bowron Lakes park area. Barkerville is an awesome living history mining village just a couple of kilometres outside of Wells. We spent a whole day here from 9am – 8pm and loved it. 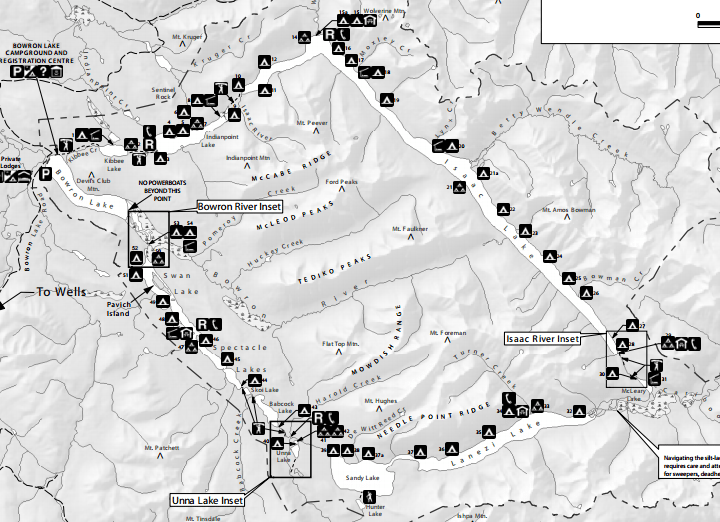 While I do think that beginner paddlers can go on the Bowron Lakes Canoe Circuit, it wouldn’t be my first choice for an introductory multi-day trip (I’d try a long overnight trip before choosing Bowron). Personally, I would recommend beginners to plan for an eight-day trip or more. Paddling for five or more hours a day (especially if new to it) can be really tiring, especially when combined with a portage or two as well as potentially difficult weather and lake conditions. Weather aside, we were incredibly lucky to have such good lake paddling conditions during our trip. There were only a few times when we experienced waves of any sort, something quite unusual for paddling lakes of this size. I said in my Della Falls post a few months ago that our friends seemed to be a good luck charm for calm conditions and this trip has confirmed it! 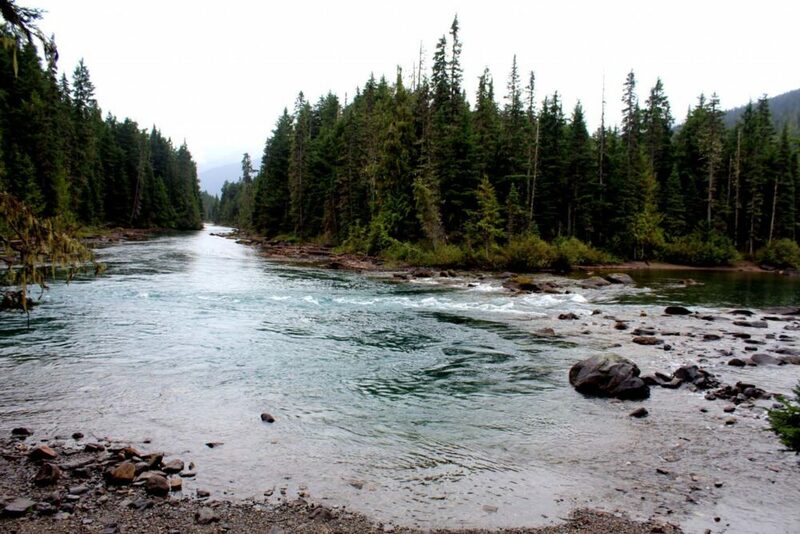 The faster-moving water sections (the Chute and Rollercoaster) can be portaged around if needed but all paddlers must complete the Cariboo River section which may require some quick directional strokes depending on the conditions. The very short mandatory river section following the Chute and Rollercoaster also can provide moving water hazards (we hit a submerged rock in shallow water). As a side note, the river sections were some of my favourite parts of the whole circuit. 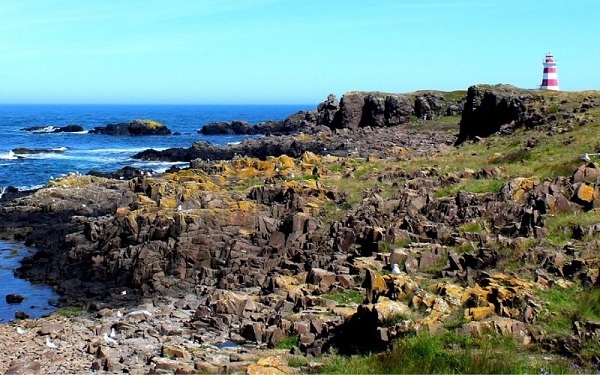 The scenery tended to be more interesting, more wildlife around and the fishing was better! Slow down and enjoy! When we left Penticton for this trip in late August it was sunny, dry and 29c. It felt strange to be packing warm clothing, waterproofs and tarps, especially for a trip where we weren’t going UP a mountain. 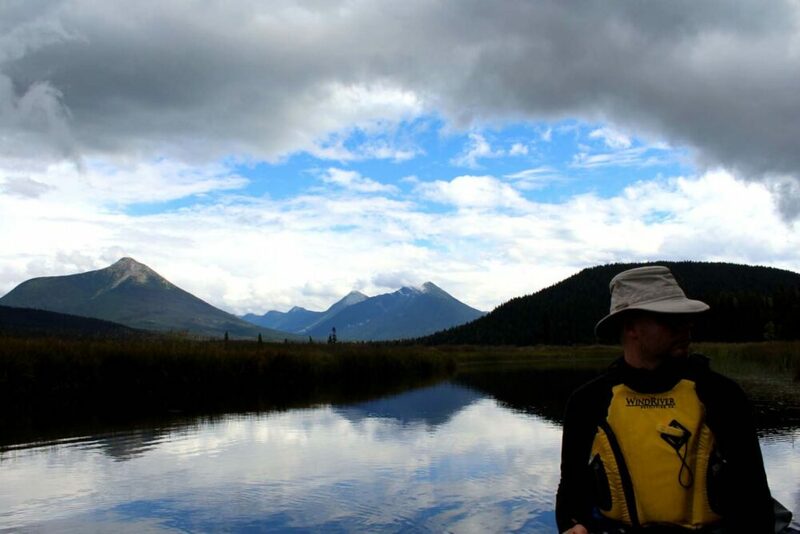 The Bowron Lakes Canoe Circuit is situated quite far north and is surrounded by mountains; consequently, it can be a lot cooler there than other areas of BC. 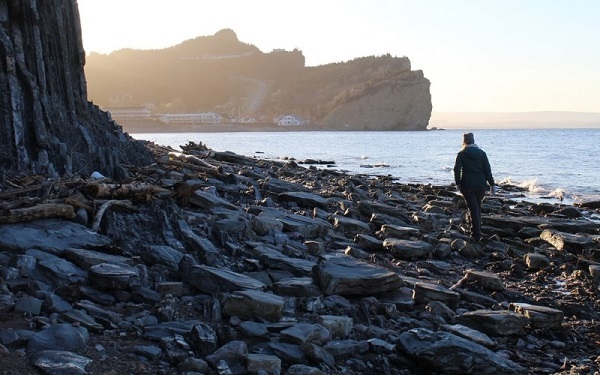 I wore my merino wool jacket (very very warm) every day of the seven-day trip. For a quieter canoe circuit experience, try the Powell Forest Canoe Route on the Sunshine Coast. 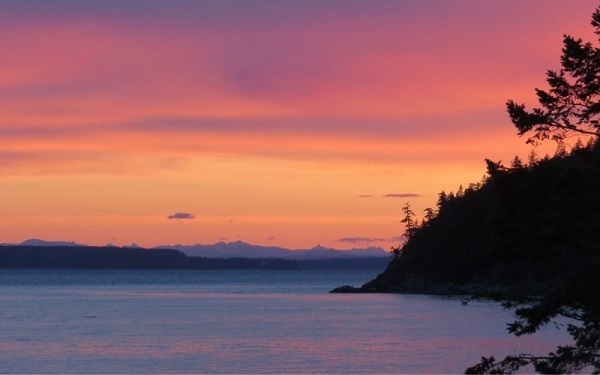 For those short on time or paddling experience, the Sayward Canoe Circuit offers an excellent three to four-day alternative. We really enjoyed both and found that they provided a much more relaxing experience due to so few other people paddling the circuits. While they do lack in the wilderness aspect in parts, they are also both completely free! If planning a trip like this, please take the 10 essentials of backcountry travel and follow Leave No Trace principles. What an adventure! Great write up! Terrific pics! You’ve done a great job Gemma of capturing the beauty and the adventure that awaits anyone willing to do the Bowron Circuit. It’s an awesome choice. 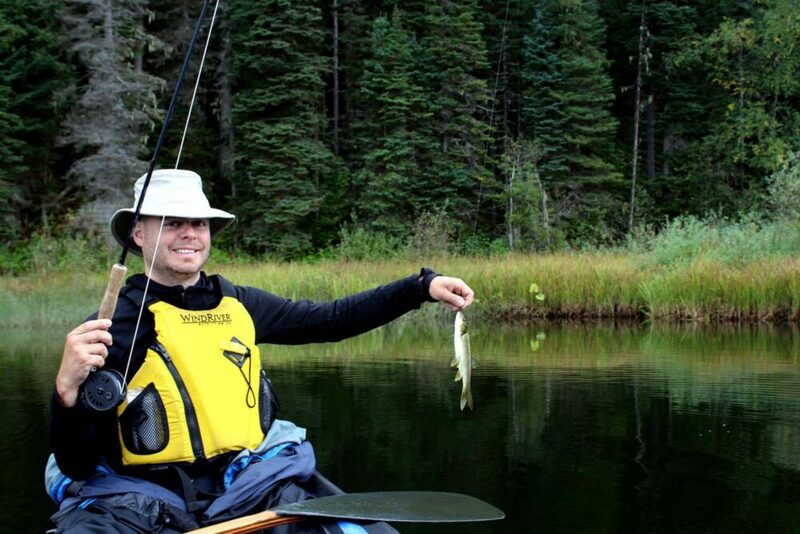 I’d also recommend Murtle Lake in Wells Gray Provincial Park. You could spend up to a week there. Had an amazing time doing the entire circuit in the pouring rain. Never had a problem with sites reserved for groups – just went in. I went with a friend who was in remission from CA. Saw a lot of wildlife, met a lot of amazing people. Suggestion: do stop at campsite #1. No one stays there. Small trappers cottage. If you stay at one of the lodges your first night before and after trip, and equipment including canoe trailer is included in the price. The people ahead of us had a weak of smoking hot weather. We got rain. Remember to book a spot early in the season. Have extra batteries and memory for camera. 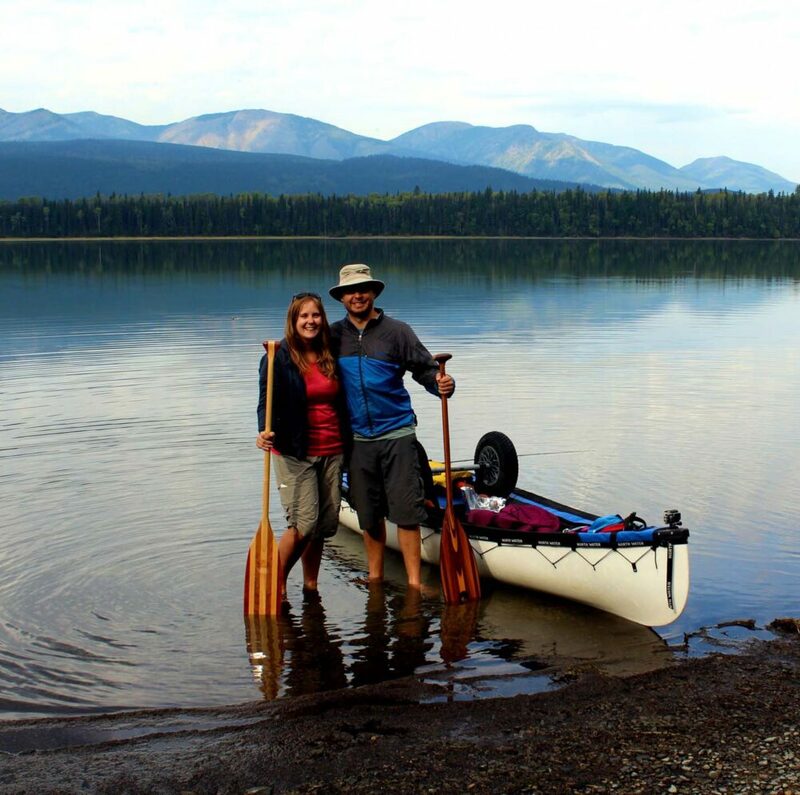 So good to hear you and your friend had an amazing time paddling the Bowron Lakes Lisa! Can’t lie, I’m a bit jealous you saw lots of wildlife, but I’m still pleased that we saw a moose and calves near the end of the trip. It sounds like you had the same weather as us, I’m happy to hear it didn’t affect your trip much. Rain is one of those things that if you are prepared for it, then no big deal. Thank you for sharing your tips about staying at the lodges and also pointing out extra batteries/memory for cameras. Interesting that you mention site 1, I actually had half a mind to stay there for our first night (it looked lovely too) but it was already taken by several groups. Site 6 was the first unoccupied site for us on our first day. We didn’t have an issue with sites being reserved, just sites already being occupied (3, 4 canoes) by the time we got there. We chose to share sites a number of nights but preferred to try and get our own sites most of the time. It’s just the kind of wilderness experience we like, no doubt at least partly due to having customer service jobs (within the outdoor industry) that involve a lot of talking! When we go on canoe or hiking trips, we like to get away and be alone with nature wherever possible. Thanks for the wonderful pics Gemma! It brings back so many memories! 18 circuits now, and we always go late May-early June, shortly after the ice breaks up. I have had circuits where we saw no-one the whole week! It’s colder, but the solitude more that makes up for it. My father’s made 10 of those with me, the last was for his 80th birthday! My first was in 1967, when I was 15. I love the fact that the circuit is basically the same, year after year, and we look forward each trip to revisiting our favourite places. Last trip was 3 years ago, but finding this page has got me excited about going again! Thanks for the inspiration. 18 circuits?! That is incredible Glenn! And even more so when you mentioned your father completing a circuit at 80 years old. I’m so glad you enjoyed this post! Have a fantastic time on your next circuit. 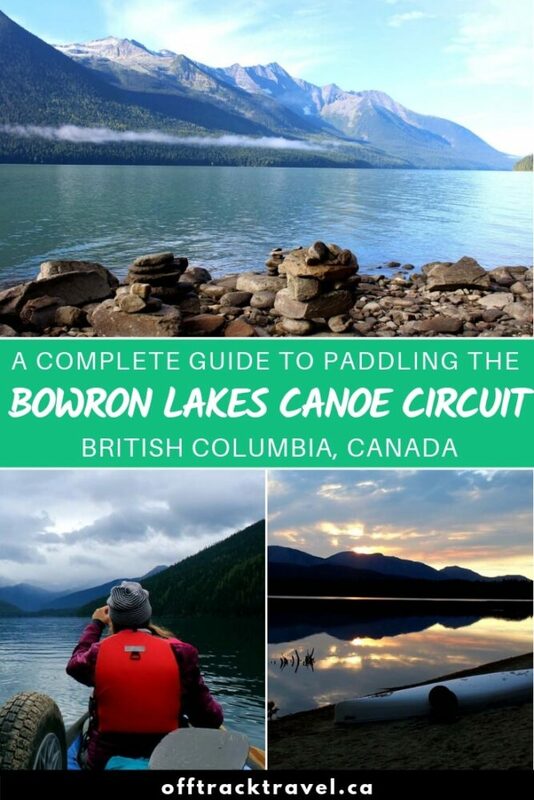 I enjoyed reading about your experience on the Bowron Lake circuit as well. Thank-you. I too prefer to be alone with the wilderness while on a canoeing trip & while reading through I was wondering to myself, “are there many spots where you can tent alone and just how busy are the portages, etc.” And then I read Glenn’s comments (thanks Glenn) lol. I’ve never done the Bowron circuit before but have done a fair bit of paddling back east in Ontario… in some areas often seeing no people at all for days on end. It’s been awhile since I’ve been on a trip though. Planning to go on one next year & thinking this might be the one. Glad you enjoyed the post, Colin. I’d definitely recommend going in the shoulder seasons (June, September) if you want the most solitude. If you have a chance, I’d love to hear some recommendations about where to go paddling in Ontario. We will be there this September/October and are finding it hard to narrow the locations down! Thanks for all the excellent information about the trip. I’m from Ontario and well accustomed to portaging canoes, was it a must to have a cart? What was the terrain like for the portages? Hi Mary! Glad you found the post helpful. It’s not a must to have a cart, although most people do use them. My partner and I are used to portaging the traditional style and a part of me wishes we had done this for Bowron. There were two portages that were very rocky and muddy, and one of these was quite steep too. Walking the canoe in this case would have been easier! Hi Gemma! Yikes— site 32 was terrible! We just finished the circuit with our 9 month old son. Loved your write up! What was the water flow like, if any? I know the one lake was very little water flow. First time going to the Bowron Lakes and so looking forward to it. I’m not sure I understand, what water flow are you referring to? The water levels during our visit were pretty normal I think.